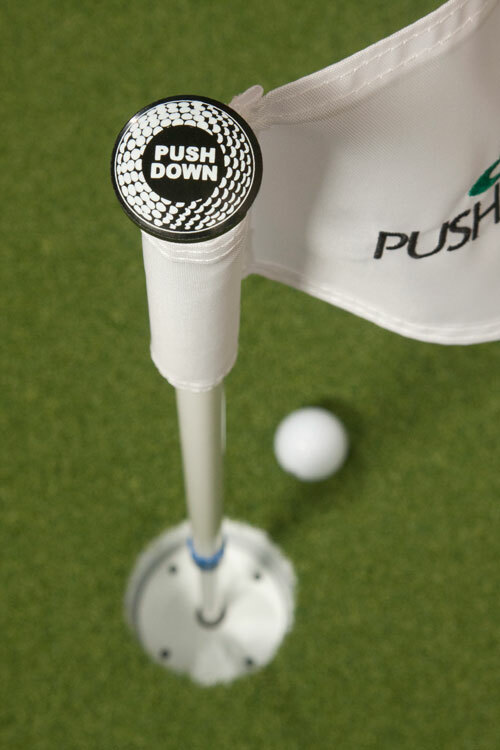 PushNPutt offers the world’s only interactive practice putting green flagstick that has revolutionized the sport. In addition to making the game more accessible to golfers of any age or ability, our products will protect your putting surface and lessen the wear and tear of your course. From novices to pros, everyone will benefit from utilizing our patented putting green flagsticks. Inventor Jerry Mallonee first got the idea for his invention after playing a round of golf with his father-in-law. Jerry noticed that his father-in-law had some difficulty retrieving his golf ball from the cup, so he went over to help. That’s when Jerry noticed the year “1958” stamped on the bottom of the cup. So with many innovations that have happened in the last few decades, it became obvious to him that the golf industry hasn’t had any revolutionary products in over half a century. This inspired him to create the world’s first interactive practice putting green flagstick. Our patented product takes away the need for golfers to bend over to retrieve their golf balls. Instead, simply push down on the flagstick, and the cup with gently lift the golf balls to the putting green. In addition to increasing your putting time and minimizing stress to your body, PushNPutt’s patented flagsticks are also great for golf pros and courses. Some golfers with knee or back problems often dig out golf balls from the cup with their putters. This not only damages the cup, but it also scratches up the turf as well. Lessen your club’s maintenance and repair costs by installing PushNPutt practice putting green flagsticks. Because our patented cup lifts and evenly disperses golf balls onto the green, each hole is less likely to be plagued by gouge marks and dented cups. And because it takes just seconds to retrieve golf balls, golfers are less likely to crowd around the hole, leaving impressions that can manipulate the trajectory of their putts. Lessen the damage and associated repair costs to your course while also improving your golfers’ experience by installing our interactive flagsticks. Every PushNPutt practice putting green flagstick features the highest quality materials available. In addition to stainless steel and outdoor plastics, our flagsticks feature custom flags, finishes and colors. Our American made products also come backed by a one-year warranty. To purchase your own interactive practice putting green flagstick, shop the selection at PushNPutt. Choose from our original model or try out our LiftNPutt, which features the same benefits as the original model. But instead of pushing down on the flagstick, simply lift up to retrieve your golf balls. Our mini PutterUp flag is also great for putting practice or indoor putting greens. It features a handle at the top of the flag that perfectly accommodates your putter. We also carry a selection of custom embroidered flags to give your green a personal touch.